SACRAMENTO - CCI cumulative outcomesA new report details how investments from California’s cap-and-trade auction proceeds are delivering on their promise to reduce greenhouse gas emissions (GHG)while strengthening local economies and improving public health and the environment across California. The report tracks the progress of the California Climate Investments, which awarded and implemented more than $500 million in new funding last year and more than doubled the number of projects statewide, spread over 57 of California’s 58 counties. The report was released today by the California Air Resources Board (CARB) and the California Department of Finance. “The investment of cap-and-trade proceeds is reaching every corner of the State, cutting greenhouse gases and improving air quality – and quality of life – for millions of Californians, especially in the state’s hardest hit communities,” said CARB Chair Mary D. Nichols. In agriculture, grants to farmers for more water-efficient irrigation technology will not only cut GHG emissions but save billions of gallons of water. More than 16,000 acres of land have been preserved, from coastal wetlands to mountain meadows, and more than 6,200 trees have been planted, providing shade on urban streets from Los Angeles to Fresno to Oakland. Designed to help California reach its climate goals, these investments are also providing an array of other benefits by creating jobs, improving air quality, and reducing transportation and energy costs. The report features profiles that highlight the impact these investments are having on individuals and communities, particularly those in California’s most disadvantaged communities. Fifty percent of the $1.2 billion in implemented projects ($614 million) is providing benefits to disadvantaged communities, including 34 percent ($419 million) going to projects located within these communities. This exceeds the requirement under SB 535 (De León) that at least 25 percent of investments are allocated to projects that benefit disadvantaged communities. Future reports will examine the benefits under AB 1550 (Gomez), which modifies the requirements for minimum investments to disadvantaged communities. The report also found that projects are underway in 97 percent of the 2,000 census tracts in the state that the California Environmental Protection Agency designated as disadvantaged. And state agencies are actively seeking to make investment opportunities more accessible to disadvantaged communities through technical assistance grants and increased outreach. Projects funded to date are expected to reduce greenhouse gas emissions by more than 15 million metric tons of carbon dioxide equivalent (CO2e), roughly the equivalent of taking three million cars off the road for a year. In addition, the High Speed Rail Project is estimated to reduce GHG emissions by almost 59 million metric tons of CO2e over its operating life. The 2017 annual report includes detailed information on cost-effectiveness and metrics for evaluating program effectiveness. Accompanying this year’s report is an interactive map that allows users to track where cap-and-trade funds are being invested anywhere in the state. Users can view the locations of individual projects and aggregate them by program and by the state’s 120 legislative districts and 58 counties. 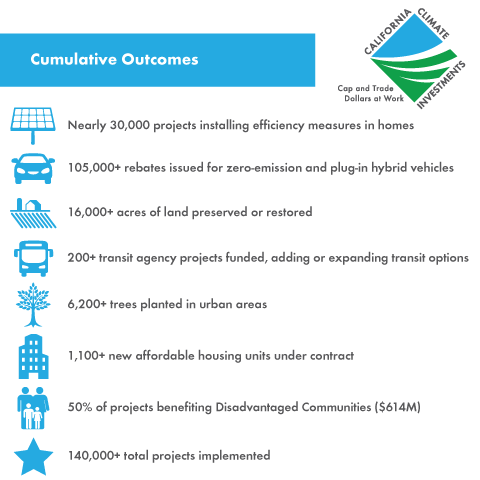 Project level data for all projects included in the 2017 Annual Report and featured on the interactive map is available on the California Climate Investments website, including project locations, GHG reductions and benefits to disadvantaged communities. The 2017 Annual Report to the Legislature on California Climate Investments Using Cap-and-Trade Auction Proceeds can be found here .